When the altitude increases, pressure also increases, and oxygen becomes depleted. The human body is capable of adapting to these conditions by increasing its ventilation and heart rate. This initial adjustment usually lasts a few days and requires a significant amount of energy. After about one week, the body will produce more red blood cells to compensate for the lack of oxygen. Prevention aims at adjusting the speed of ascent to allow for acclimatization. Adjustment to hypoxia is determined by each person’s genetic predisposition (a 20 years old athlete may have a harder time than someone who is 60 years old). Feeling of chest congestion etc. NOTE: If none of these options are available, THE PERSON MUST BE EVACUATED. *IMPORTANT* When symptoms of altitude sickness appear do not underestimate the symptoms, even minor ones, and do not ascend any higher. If possible, descend. 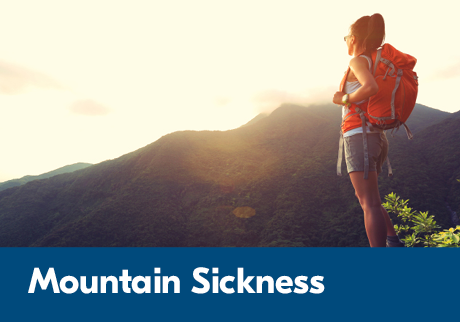 It is important to quickly recognize mountain sickness given the possible progression to cerebral and /or pulmonary edema.